Trump signs into law defense spending bill which codifies memorandum of understanding with Israel. 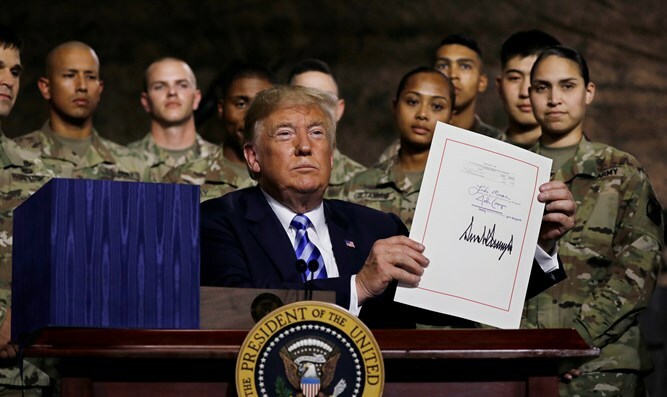 U.S. President Donald Trump on Monday signed into law a defense spending bill which codifies a ten-year memorandum of understanding with Israel negotiated during the Obama administration. The bill includes $500 million for U.S.-Israel missile defense cooperation and up to $50 million for U.S.-Israel cooperation to detect enemy tunnels into Israel. The measure was approved by the Senate earlier this month before going to Trump for his signature. In December of 2016, the U.S. Senate voted in favor of a defense policy bill which includes more than $600 million for missile defense cooperation with Israel. This aid is separate from the memorandum of understanding signed between Israel and the U.S. in September of that year, and which grants Israel $3.8 billion annually beginning in 2018 and through 2028.